This week's Product Story showcases Built-Rite Tool & Die and their use of Desktop Metal Solutions. Built-Rite Tool & Die is a mold-making and design firm in Massachusetts with expertise in precision mold manufacturing. They specialize in the production of molds for plastic injection molding. Businesses like Built-Rite know pressure from international and domestic competitors. Additive manufacturing and 3D printing gives Built-Rite the ability to have shorter lead times as well as reduce costs for quick-turn mold services. The potential to iterate quickly is critical to winning project bids and for meeting tight deadlines. For Built-Rite, the Desktop Metal Studio System introduced the ability to make quick-turn mold assembly components with a process that is far less labor-intensive than other equipment in their machine shop and more cost competitive than a third-party prototyping firm. The mold-making process is extensive, requiring precise planning and execution while adhering to client deadlines, iteration and expectations for part quality. By reducing material usage and printing with closed-cell infill, Built-Rite can produce lightweight parts within the mold assembly without impacting wear resistance required for tooling applications. Additional testing will consist of leveraging the design flexibility of the Studio System to produce mold inserts with con-formal cooling channels that follow the shape of the mold cavity. 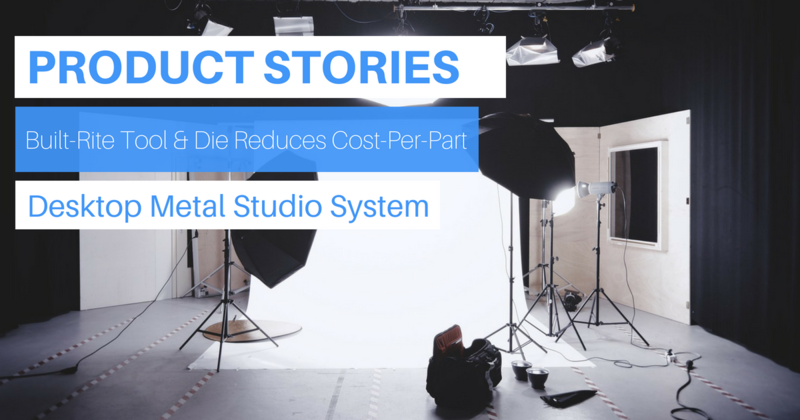 By reducing cost-per-part, cutting costs by 90% and saving time by 30%, Built-Rite Tool & Die has streamlined their workflow thanks to the Desktop Metal Studio System.